Instantaneous phase is useful for highlighting changes in phase along events. 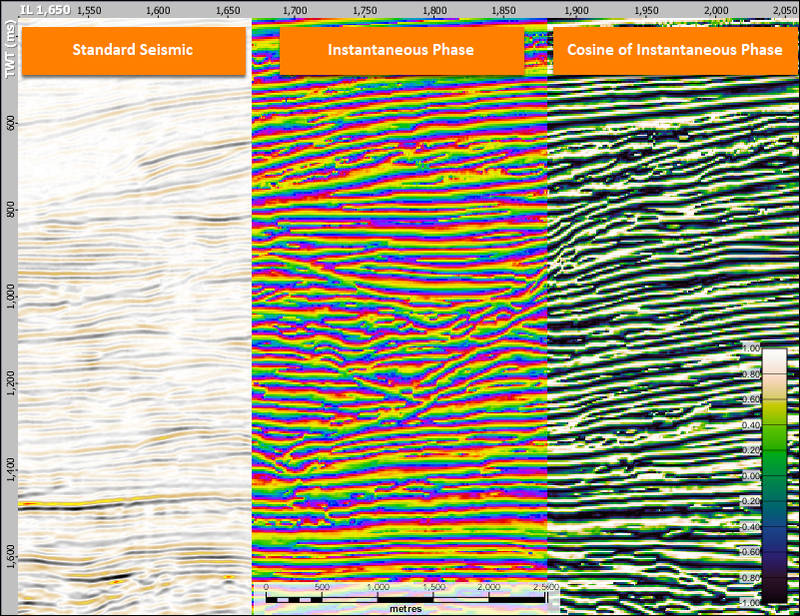 It can be used to identify potential fluid and lithology changes, to increase apparent resolution for fault discrimination, or to guide interpretation with an amplitude independent view of the seismic. Interpreting instantaneous phase angle in degrees or radians is challenging! Displays work nicely with a 360 “wraparound” colourbar, but picking horizons on phase is complicated by the -180 to 180 transition. Transforming the data using the cosine function provides a smoothly varying result which is much more suitable for interpretation. In the Process tab, add a new Instantaneous Attributes process. Volume: select the volume to analyse. Instantaneous Attribute: check the Phase box. 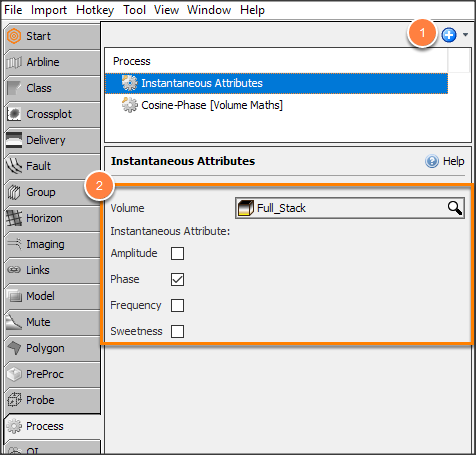 An instantaneous phase result is created in the Volume tab. Add a Volume maths process and give it a name e.g. “Cosine-Phase”. 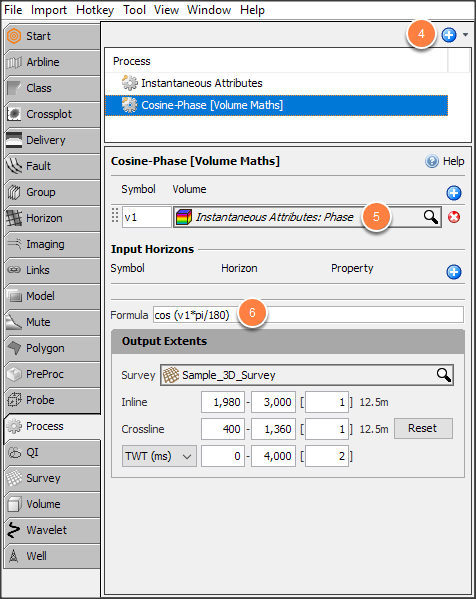 Add a Symbol and select the volume from the process in step 3. The cosine of instantaneous phase result is created in the Volume tab. 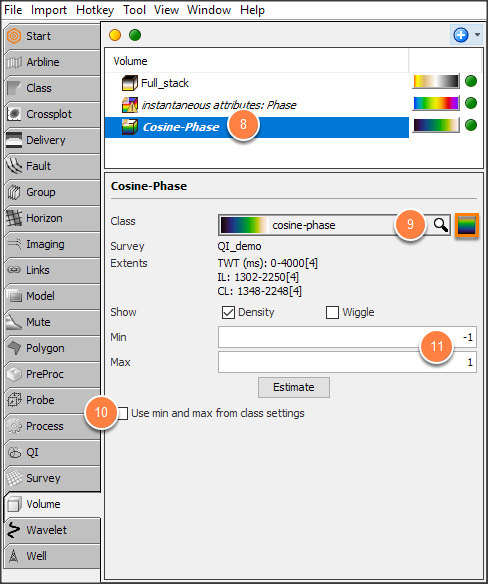 Go to the Volume tab and select the Cosine-Phase volume. Select an existing or create a new class. name the new class e.g. "cosine-phase"
load a distinct colourbar e.g. "Ramp-Balanced-BlueGreenWhite.ducolbar"
Uncheck the Use min and max from class settings checkbox. Set the Min/Max value to -1 and 1 respectively.